It is finished. These are the climactic words of Jesus’ life. Everything he did and said leading to this final moment: It is finished. But what did he mean by these words? How might those around him have heard them; how do we hear them? For some, like the Pharisees, these words mean that the nuisance is over and we can go back to the way things were before, unchanged and unaffected. Lent is behind us and now we can go back to eating chocolate. For others, like Peter, these words mean that we’ve run out of time, we have let him down. Maybe we didn’t live up to our Lenten promises; maybe we feel like we haven’t “earned” Easter. For some, like Mary, these words mean that at least the suffering is over. As someone who lost his grandmother to cancer this year, I know exactly what this feels like: at least she’s not in pain. It is finished. In each of these interpretations, there is some truth, but it is not the complete truth. Jesus may be gone, but what he did was so profound that we cannot help but be changed; we may have fallen short and missed our chance, but we know that he will rise again no matter what we did; we take consolation that at least he is not in pain any longer, but really, we know that he has entered into his glory. Because of this, I think Jesus meant something very different with his final words: “I have done what was mine to do. God the Father has sent me to be the perfect manifestation of his self-sacrificial love for the world. In my life and in my death, I made visible what could not be seen, made clear what was not fully known, that God is by God’s very nature self-emptying love. I have lived with perfect obedience and have poured out everything that I had to give. I showed the way. I revealed the truth. I have given life. 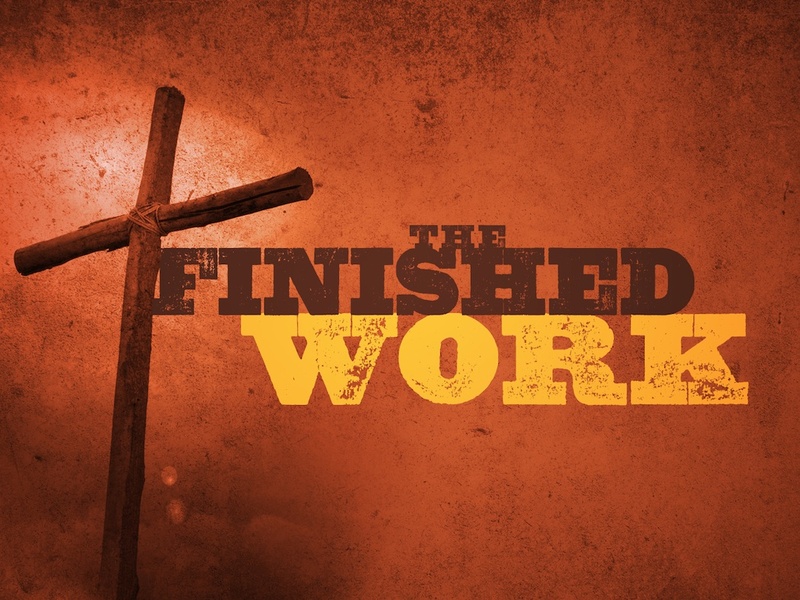 [deep breath] It is finished.” His words are of great relief and satisfaction as in a job well done. What Jesus did with his life and death on the cross was pure gift: freely given, unmerited love for the world. There is nothing we did to earn it; nothing we did to cause it. Jesus did not come because we sinned, we did not place the cross upon him as a burden he must carry. It was not given to us so that we would owe him something or be forced to love him in return. No. “God so loved the world that he gave his only Son so that everyone that believes in him might not perish but have eternal life in him.” Jesus was completely free, and he chose to give of himself, to take up his own cross, and to hand over his life. He did this not out of guilt or obligation, but because he loves us. His life was both the example and the source of strength for us to follow him. In this way, the grace of Jesus’ life and death is all around us. Everywhere we look we can see him if only we have the eyes to see. He is in the mother or father that gives up what they want for the sake of their children; He is in the person that chooses love, not revenge, when they are insulted; He is in those who give when they know it won’t be noticed or reciprocated; He is in those who care for people who cannot or do not give them thanks; he is in those who suffer greatly but do not despair because they have hope in God; He is in those who are forgotten, unwanted, and misunderstood. When we encounter these people; when we choose to give of ourselves in a self-sacrificial way, not counting the cost but simply giving everything we have because God has loved us, Jesus is anything but dead: he is living among us. Thank you Casey for reminding us once. Ore the true meaning of the Easter season. Your words are always spot on. God bless you this season. Studying these words also in a study bible, I noted that Our Lords words also meant during the times that a deb was PAID. the words “it’s finished” was written on a note that was paid up. There are man beautiful, meaning truths behind Jesus’s words as usual…..God bless you.